faile | What's Up Mann? In case you’re not the kind of person who pays really close attention to movies and follows the UK street art scene, there’s a really interesting case of life imitating art going on right now. In Alfonso Cuarón’s brilliant film Children of Men—about the worldwide chaos that ensues when the human race loses the ability to have children—there’s a scene where Clive Owen visits his cousin to get a travel visa. The cousin works for the government and is in charge of preserving great works of art, like Picasso’s Guernica and Michelangelo’s David, so they don’t get destroyed in the anarchy. As Clive Owen enters his cousin’s place, in the background there’s a large chunk of wall that has Banksy’s Kissing Coppers on it. Banksy is an anonymous UK street artist who’s almost more of a folk hero and media darling than a vandal. When a new work by Banksy almost magically appears on the side of a building, it’s on the 6 o’clock news. His work is highly sought after and fetches top dollar at auction houses. In the city of Brighton in the south of England, on the side of a pub you can see Banksy’s Kissing Coppers. The stencil is protected by a piece of plastic that’s bolted to the wall to preserve it. It’s also a reproduction. The real Kissing Coppers has been removed from the wall and is sitting in some extremely wealthy person’s art locker. In fact, most of Banksy’s work in England has these plastic sheets over them, preserving these now valuable commodities. There’s an undeniable frenzy going on in England about Street Art right now. Banksy is the catalyst, but there are a lot of other amazing artists getting their work up in the streets. In fact, some of the best artwork you can see in the UK can be found while walking through the alleyways of East London. It should come as no surprise that the “legitimate art world” is taking notice of this. This summer, The Tate Modern in London brought in six of the world’s finest—Blu, Faile, JR, Nunca, Os Gemeos and Sixart—to decorate the massive façade of the biggest and baddest contemporary art gallery in England. Faile is an artist collective from Brooklyn consisting of Patrick Miller (originally from Minnesota) and Patrick McNeil (originally from St. Albert Alberta). The two met when they were young and eventually formed A-life in 1998 with third member Aiko Nakagawa (originally from Japan, she left the collective in 2006). In 1999, after realizing there was a shoe company in New York using the same name, they reordered the letters of A-life to come up with Faile. Their style is an unmistakable collage of romantic and poppy appropriated imagery and typography. The collective has been hitting streets and galleries all over the world ever since. Their work has not gone unnoticed and it’s common to see one of their original works on canvas sell for over $100,000 either at auction or at Lazarides, the London gallery that represents them. Mere mortals can purchase low edition prints of their work for a few thousand dollars. However, the demand for their work is so high that you need to win a lottery on their website for the privilege to purchase one, or you’ll have to shell out more for it in on eBay. I was fortunate to have a chance to chat with the Canadian half of Faile, Patrick McNeil, from his studio in Brooklyn as the collective, fresh off wrapping up a massive online print release, is preparing for a November show in London that will be put on by themselves in conjunction with Lazarides Gallery. What made you want to pursue a career as a professional vandal? Uhhhm… I don’t know. I never really looked at it as being a professional vandal. How about street decorator or neighbourhood beautifier? down on Canal Street and got to see it change and be alive from day to day. I just got fascinated with it and wanted to be part of the dialogue that was going on. Whose work were you seeing on the streets at that time that made you want to go out and do it yourself? Bast and WK Interact. Shepard Fairey. There were a lot of graffiti artists who were interesting to watch as well. When you’re tuned into it you’re watching everything. Different artists and different writers inspired me in different ways. 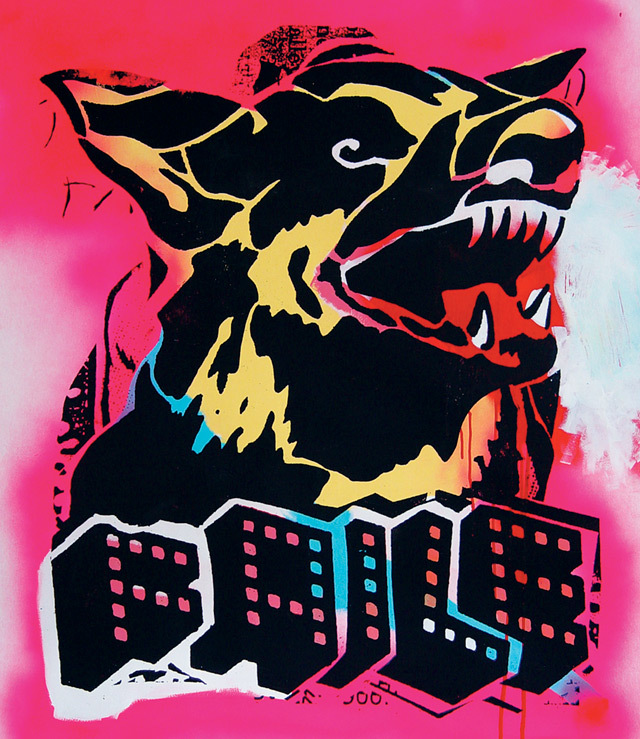 Faile’s primarily known for stenciling and screenprints. Where are you appropriating your imagery from? It comes from anywhere and anything. It could be from a fish and chips box graphic. Everything is mixed and mashed. Some of it is drawn by us but it is a host of appropriated imagery all collaged and fucked up. You guys have a rep of being the nice guys of street art. I thought it was kind of neat how you brag at the same time and will work in “Brooklyn’s Finest” into your work. Does Faile like to brag? You sign your work 1986, which is a reference to the Space Shuttle Challenger.What is it about that disaster that makes you want to incorporate that into your work? It’s kind of an off-spirit answer but in the beginning 1986 did come from the Challenger disaster. We were talking about putting things up on the street that you would see and connect with. For instance, you look at a piece of graffiti and you see and read it and that’s about it. We did this Space Shuttle Challenger going down with flames on it and had ‘Challenger’ written below it. The idea was “Oh Challenger” but there would be a secondary reaction, possibly with the person you’re with, “Hey, do you remember where you were when the Challenger disaster happened.” And then a whole host of stories would come up with people’s different experiences. It’s the idea that the power of a graphic can transport you back to a memory. It’s almost like a 9/11 type incident. Yeah, or Kennedy. That was at least the origin of it. 1986 was used a lot in paintings and repeated and stamped and repeated and painted. Then it became almost a secondary signature. Faile 1986. Why do you guys put coffee on your work? Or, if you prefer, artistically decorate your work with coffee. We actually only spill coffee on or work because we’re drinking it all day long. There’s Bailey’s and scotch in it and we get all tipsy and spill it all over the floor. At what point did you realize Faile was going to take off and you could make a good living off of your art? It would have been after the first time we did a print run. A friend of ours started a blog where every month he showcased an artist. One month he showcased us and decided to do a print from an edition of 12 and released it in conjunction with the show we did online. It sold. We were like “we should sell prints on our site.” I didn’t think there was the demand. Then we put them up and they sold. We made enough from this to support what we needed to support. We didn’t have to do any design work anymore and were able to focus 100 percent on Faile. That was about two years ago. When did the “legitimate art world” take notice of Faile? When did the “legitimate art world” take notice of Faile? That might be a good question for the other Patrick. I’ll ask…. February 23rd, 2006. He had it written down on his desk. You guys have always been on the street and in the gallery. How important has it been that your street work translates really well to the gallery? I’ve enjoyed both and always put the same energy into them. I never felt like we had to put the street into the gallery. They’re two separate things. The gallery is its own beast and the street is a different one. I’ve always enjoyed both and found both a challenge. How do you account for street art being so much more popular in Europe than it is in North America? I think it is popular here; I just don’t think there’s a market that’s grown up like there has in Europe. It’s happening, it’s just slower. I don’t why it happened. I think Banksy has a big part to do with why everything exploded. It’s a phenomenon that started over there and maybe people over here are just starting to realize there’s value in it. We have great artists coming up here too. Would you agree that despite this inferno market existing in Europe, the quality of work right now coming out of Brooklyn is actually better? I don’t know. I feel there’s a different energy. My favourite artists are all coming out of Europe right now. There’s only a few in the US where I think they’re doing amazing stuff. The one that’s really blowing my mind right now is Blu. That’s great you brought up Blu because he’s on the front of the Tate Modern with you as well right now. How did you guys end up throwing up this gigantic mural on the front of one the biggest art galleries in the world? Luck. There was a guy who was doing a book for the Tate and he contacted us almost two years ago when we did the show at the [Newcastle UK] Baltic Gallery. Not because of the Baltic, but he’d seen our stuff in London and we did an interview for the book. When they launched it he just thought of us and asked us if we’d be interested, two years after the fact. It was just a lucky thing. How did you choose which image to put on there? I believe that you need to push things and look close to where you are. Sometimes right in front of you. There’s a painting that we just finished in studio that was like that. We agreed and just busted it out. It’s a new image of what we’ll be messing around with for the November show. If someone was like “Hey an exhibition at the Tate is not what street art is all about,” how would you respond? Yeah, or like a big Nike show ad or a Gatorade event. Is it flattering or insulting to have someone remove your work from the street and try to sell it? I was looking at an auction a few months back and someone was trying to sell an entire wall display you did in Berlin. I just give in. You put it up knowing either the wind is going to take it or someone else is going to take it. Hopefully it stays there longer so more people can enjoy it. On the scale that it’s been done, like taking steel doors and that kind of stuff? That’s a little nuts. I guess someone’s saving it. Maybe that’s a good thing? Do you have any idea who these people are who are buying walls harvested off the sides of pubs with Banksys on them? No idea. It’s pretty crazy. We don’t authenticate anything that comes off the street as it was never the intention to sell it. People will take a large door and cut it up and sell it as different pieces rather than one whole piece. That’s kind of strange. Does that affect where you put your work now? That’s the other crappy thing. It’s not like before when you could go and put a bunch of stuff up in the city. I like to work on doors. I like working on crappy wood. Unfortunately, wood is something that’s easily removable. Now when we go out it’s not as fun. It lasts a day then someone is trying to hawk it. So it’s like “Why are we doing this? Nobody’s enjoying it.” I’m risking my neck out there, possibly getting arrested, and then what? Someone’s just gonna take this and sell it. Oh I don’t know. Maybe three or four years ago. Wouldn’t it almost be comical getting arrested now considering how established you guys are as artists? No, I know lots of established people who’ve been arrested and it’s not that comical. You have to hang out in jail and eat crappy food. What’s your worst prison food memory? It was some baloney white bread sandwich. I didn’t eat it but it made a good pillow. Finally, I’d like to ask you about a recent UK tabloid article that claims to have outed the true identity of Banksy. Do you have any thoughts on this article? No. No… no, no. I don’t know what to say about it. Sooner or later they’re going to hunt you down if you get that much press. British tabloids are notorious for that kind of exposé. I read the article and at least they went about it kind of nicely. Except the whole showing up at people’s houses and asking for interviews. Yeah, showing up at his parents’ house and harassing them. That’s kind of lame. Aren’t you glad you’re not anonymous? You’ve met the man. Do you have a good story about a time you went out drinking with Bansky? In my head I think he’d be one of those amazing Brits you randomly meet in a pub who’s full of witty and humourous things to say. He’s totally not that kind of guy. He’s one of the slyest guys I know. He’s great but I don’t want to talk about him too much. Well good luck with your show coming up in November… though I’m sure you don’t need it.